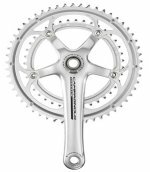 There are four versions of the Campagnolo Centaur Chainset, which is a 10 speed: Campagnolo's Carbon double chainset. : standard and compact, in aluminium alloy or in carbon and both in different crank lengths. The Ultra Torque system ensures maximum rigidity and minimum dimensions. This chainset requires the Ultra Torque bottom bracket. Double choice: Aluminium or Carbon. Large chainrings with eight pins for upshifting the chain. Ultra-Torque type bottom bracket.